Rubber magnet is referred as a lightweight composite material that usually made of rubber and ferrite magnet powder or rare earth powder etc., compound with rubber, resin and other materials. Formed by extruding, injecting or calendaring, the rubber magnets have different shapes such as strip, sheet, or roll. This kind of magnets can be made with any shapes by pressing or cutting and can be coiled to 1/4'' radius without breaking due to its character of plasticity and flexibility. There are two different kinds of magnets in flexible rubber magnet: ''Isotropic'' and ''Anisotropic''. The Isotropic rubber magnet normally is to be magnetized with multi-poles magnetization on one side only and the Anisotropic one has magnetic on both sides. 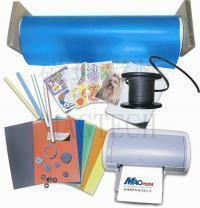 It also can be laminated by colorful P.V.C., adhesive tape or colorful printing. The attractive face is treated with UV coating which can project the products surface based on customer's demand. As a leading manufacturer of magnets in magnetic market, Magtech specializes in providing different kinds of magnetic products for our worldwide customers. We also can supply ''Magnetic Paper'' for A4 size, which made from rubber magnets and laser paper. The thickness just has 0.3mm which can be printed by any printing machine. If you have any other requires, please visit our website www.magtech.com.tw and contact us right away.